Protests in Hong Kong entered the 5th day with no sign of letup. The protest movement followed a controversial decision in which candidates for chief executive of Hong Kong in the 2017 elections be made by a committee, rather that a general election. Election by committee is billed as "election reform". Protests intensified after police used teargas in an attempt to disperse student protesters. Pro-democracy protesters now number in the hundreds of thousands. The protesters demand a free election and the resignation of Hong Kong’s current chief executive CY Leung. 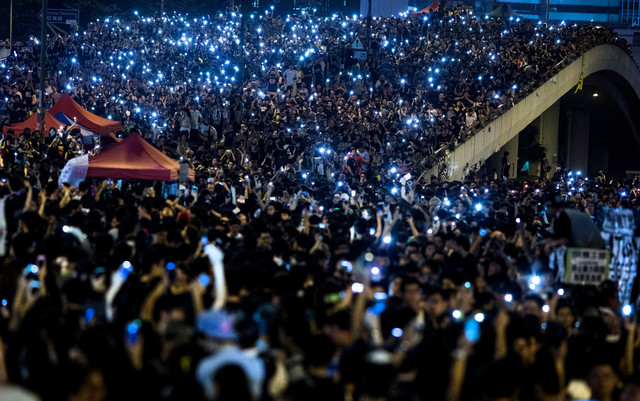 This is the greatest mass protest in China since the Tiananmen Square Protests of 1989. Hong Kong is an island of free speech and civil liberties in an authoritarian sea. It is not, however, a democracy. 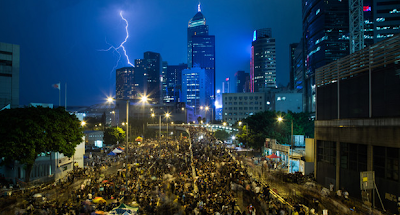 Hong Kong citizens have never had the power to choose their top leader, neither as part of China since 1997 nor as an outpost of the British Empire for 156 years before that. Now the prospect of the first direct election of a chief executive in 2017 is increasing the tension between Hong Kong’s yearning for autonomy and China’s for loyalty. The Financial Times reports Tension Mounts in Hong Kong as Police Mass. The stand-off between the authorities and demonstrators calling for the resignation of Hong Kong’s chief executive CY Leung had continued for a fifth day ahead of the midnight deadline given by demonstrators for Mr Leung to stand down. The huge protests have been going on since Sunday as crowds flocked to join the democracy movement calling on China to reverse course on a controversial plan for electoral reform in the territory. On Thursday night students blocked a road to Mr Leung’s office as they prepared to escalate their campaign, while the road to the chief executive’s office in the Central district was cordoned off at both ends by the police. Bloomberg reports Hong Kong Leaders Will Open Talks With Protesters. Hong Kong’s top official Leung Chun-ying appointed his deputy Carrie Lam to hold talks with leaders of pro-democracy protesters who have crippled parts of the city for the past week. Chief Secretary Lam will discuss constitutional reform, said Leung, who reiterated he won’t resign. Student leaders also urged thousands camped outside government offices to keep calm after they earlier threatened to besiege more buildings if Leung didn’t quit by midnight. The messages from both sides were the most conciliatory since tens of thousands of mostly young people began rallying on the city’s streets to demand democracy and Leung’s resignation. Student leaders said earlier last night that they would be prepared to speak to Lam, as tensions grew and police warned protesters they would deal firmly with any escalation. Messages may be conciliatory, but Hong Kong Police Draw Line on Occupation of Buildings. Police also stockpile teargas in government buildings. Around 4 p.m., police were seen carrying boxes and canisters into the government complex, with at least one box labeled as containing tear gas. Student leader Joshua Wong said police appeared to be stockpiling gear, including gas, rubber bullets and pepper spray, in preparation for taking action. Wong, founder of the student activist group Scholarism, told a crowd yesterday that if Ip wants to talk, she should come down to the protest site and address everyone. Talks with the protesters are impossible if the pre-condition is the resignation of Leung, Jasper Tsang Yok-sing, president of the the city’s Legislative Council, said in a press conference today. Demonstrators shine lights from their mobile devices as they hold them aloft during a ongoing protest outside the central government office in Hong Kong, on Oct. 1, 2014. 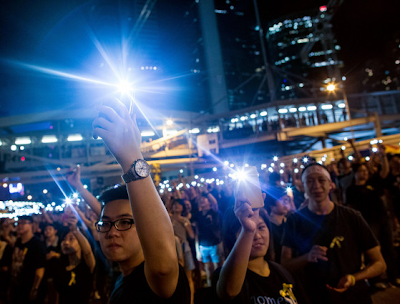 Demonstrators shine lights from their mobile devices outside the central government office in Hong Kong, on Oct. 1. 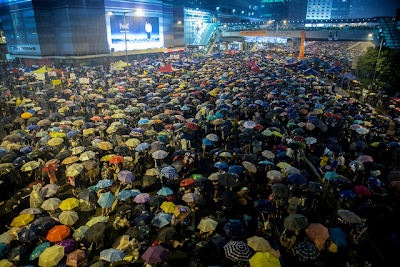 Demonstrators shelter under umbrellas during heavy rain storm outside the central government complex, on Sept. 30. Lightning strikes as demonstrators gather outside the central government complex in Hong Kong, on Sept. 30. All images by Lam Yik Fei/Bloomberg.